Make Fluffy Ricotta Blueberry Pancakes to Start Your Day. 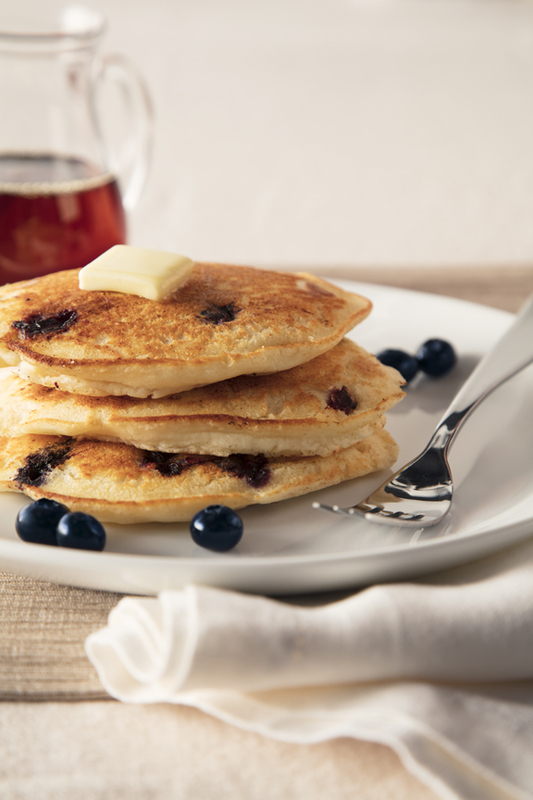 Start your morning off the right way by making pancakes from scratch with this easy to make Ricotta Blueberry Pancake recipe. By adding Ricotta to your pancakes, not only have more protein than your traditional pancake, but they come out extremely fluffy. In a medium bowl, whisk together the ricotta, eggs, vanilla extract and milk until well combined and smooth. Sift in the four, sugar, baking powder and salt; mix until combined. Do not over beat the batter. This will be thicker than normal pancake batter. Gently fold in the blueberries. Heat a nonstick pan or skillet over low-medium heat. Grease with a small amount of butter (or oil spray) and pour ¼ cup of batter onto the pan. Cook until bubbles form, gently flip and cook the other side until golden brown and cooked through. Repeat the last 2 steps with the remaining batter. Serve with extra blueberries, maple syrup or any topping of your choice. You can always substitute blueberries with bananas or chocolate chips! If you have any leftover ricotta, try adding some to your scrambled eggs. The recipe can be found at galbanicheese.com/ricotta-scrambled-eggs.